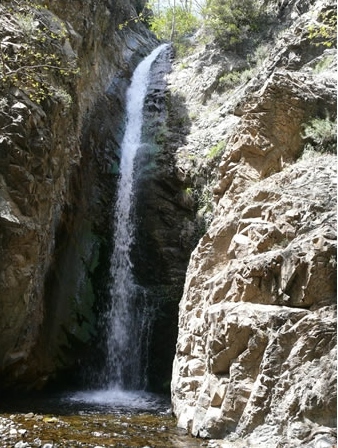 Our excursion of Sunday 22 March 2015 takes place at the Troodos mountain range. This is an extraordinary outing of the Cyprus Strollers, since it involves not one, but two hikes and a picnic. In addition, the outing offers the not so common excitement of a visit to a waterfall. The first hike starts at 11:30 am. Xenophon is leading this outing, which will go ahead even in light rain; if you need to, call 97613720. Troodos is the highest mountain of the island, with its highest peak (Hionistra) at 1950 metres altitude. Troodos is covered by a variety of pine trees, junipers, cedars and fir trees, and also presents the majestic golden oak, an endemic species to Cyprus, as well as a rich variety of bushes and wild flowers. Troodos is also a rare geological phenomenon. The 1st trail takes place in the village of Platres, one of the prettiest mountain resorts by any standard, which inspired the famous Greek poet George Seferis. From Platres we walk to the Myllomeris waterfall, at an altitude of just over 1000 m and back. Total hiking time is under 90 min and degree of difficulty 2 (medium difficulty). The trail involves a few downhill and uphill sections and part of it is alongside the banks of the river Kryos Potamos. The river flows all year round and vegetation in the area is rich, with many plane trees and bushes. The waterfall comes at the end of the trail and is impressive, falling from a height of over 15 m. It derives its name from the word ‘myllos’, which in Cypriot dialect means wet, and the word ‘meros’, which in Greek means place. At the conclusion of the Platres-Myllomeris hike, we return to our cars, to drive to the start of the 2nd hike. The 2nd hike takes place at Kampos tou Livadiou, which lies some 1800 m from Troodos square, on the return drive to Nicosia. Kampos tou Livadiou is a circular trail, 3 km long, will require about one hour and degree of difficulty is 1 (easy). This hike is at an average altitude of 1650 m, in a forest of black pine and juniper trees. After the 2nd walk we shall drive a short distance of a few hundred metres to Livadi tou Pasha, a designated picnic site (equipped with tables, benches and facilities), for a picnic, weather permitting. This creates an advantage of not needing to carry your picnic food and drinks on the trail; you may keep it in the boot of your car. You have the choice of meeting the group at the 1st walk start, if you are very familiar with the place, or meet at the designated meeting point in Nicosia. In either case, you need to carry copy of this set of instructions. Meeting in Nicosia offers two important advantages: we drive in full cars, leaving some cars behind; thus, we save in fuel and enjoy the trip in good company. The meeting point in Nicosia is the very large church named tis Theou Sophias (also referred to as Agia Sophia) in Strovolos, which offers ample parking space on its side street. The car trip starts at 10:00 am. Please ensure you observe start times, for the benefit of the group. From Nicosia take the A9 motorway towards Troodos. The A9 smoothly becomes the B9 highway towards Troodos, when the motorway ends, near Kokkinotrimithia. On the B9 you drive past the villages of Akaki, then Peristerona and then you reach the village of Astromeritis. At the Astromeritis traffic lights, where most cars turn left towards Troodos, zero your odometer and turn left. Drive along the main road. After 25 km you pass the village of Kakopetria. Continue to drive along the main road, in the direction of Troodos. At the 33 km reading, you reach a crossroads (no traffic lights), named Karvounas. Do not turn left (this takes you to Kyperounda village and Madari mountain). Do not go straight. Turn right towards Troodos square. At the 39.7 km reading you pass Kampos tou Livadiou on your right. At the 41.6 km reading turn left into Troodos square, past the car park on your left. At the 41.9 km reading you reach the end of Troodos square, with a roundabout; take the second exit of the roundabout and drive downhill, in the direction of Platres. At the 49.4 km reading you reach the junction of Platres/ Psilo Dendro, where you need to turn right, to enter the village. At the 49.9 km reading you reach another junction; both roads, the one continuing straight ahead and the one turning left will get you to your destination. Turn left, because it will take you along a shorter route, downhill. At the 50.5 km reading you drive past the police station on your right. At the 50.6 km reading you drive past the Petit Palais hotel on your left. Continue straight, downhill, towards Kato Platres. At the 51.0 km reading you reach the main village church, Panagia Phaneromeni. Park in the car park on the right, on the same side as the church, which lies about one hundred metres before you reach the church. We meet inside the open air car park. Zero your odometer as you depart from the car park. Drive uphill on a straight path and out of the village of Platres, past the Petit Palais hotel on your right, past the police station on your left, until you reach a T-junction at the 0.8 km reading. Turn right at the T-junction. At the 1.3 km reading you reach the main road to Troodos. Turn left and drive uphill along the main road to Troodos. At the 8.8 km reading you reach Troodos square; follow the main road as it bends left and goes through the square. At the 9.2 km reading you reach the exit of Troodos square at a T-junction; turn right, following the road sign to Nicosia. At the 11.0 km reading drive carefully, looking out for the road sign marking the Kampos tou Livadiou picnic site and hikes, on your left. Turn left and park your car. If you prefer, stay close to the walk leader and drive to the 2nd hike start in a convoy.